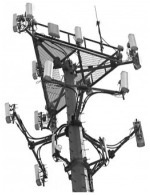 What's The Shocking Truth About Cell Tower Buyouts They NEVER Tell Landlords? Welcome to our cell tower lease buyouts blog. What's the shocking truth about cash lease buyout offers they NEVER tell landlords? Selling your cell tower lease revenue stream can provide landlords who have cellular tenants with significant cash lump sum payouts. At the end of the day, everyone has their own reason why they may be looking to sell their cell site leases. The net present value of your cell tower lease will not equal what you could make long-term on the site, but selling your telecommunications lease is truly the only way to hedge your risk against losing the site to carrier consolidation and the possibility of the cell tower becoming obsolete due to future changes in technology. Basically, when you take a cell tower buyout offer for 13X or 14X of what your current annual rent is, you are betting that there is a possibility that the cell tower rent will be less or non-existent in the next thirteen or fourteen years, and you are transferring that risk from you to the buyer. This begs the question, if the cell tower is possibly “going away” in the future, why would they want to purchase it from you? Buyers of rooftop cell site leases and tower leases can spread this risk and will either hold or possibly re-sell your telecommunication lease at a future date for a profit or loss. However, let the seller beware... you are swimming in shark infested waters. Make sure you don't become a cell tower shark's next meal. 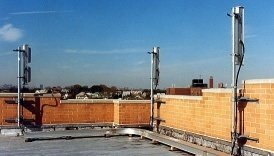 As a cell tower landlord you are probably getting multiple calls and multiple offers from third party financial firms that purchase rooftop wireless leases and cell phone tower leases. If your Verizon Wireless lease, AT&T lease, T-Mobile lease or Sprint lease was assigned to tower management companies in the vertical real estate industry like American Tower, Crown Castle or SBA Communications, they are probably contacting you regularly for a lease extension, and those offers usually contain the option of selling the rights to the lease to them for a perpetual easement or one-time cash lump sum payment or on a payment schedule of five or ten years. You may be getting cells to sell your lease or extend the lease from companies like Md7, BlackDot or the Lyle Company. Recently many cell tower landlords have been contacted by a new company called Everest Infrastructure Partners and wondering if the offer is viable? The #1 question that we get almost every day from cell site landlords is, "How do I know that I'm getting a good deal on a cell site buyout offer?" You're probably trying to differentiate between the real bona fide buyout offers and whether or not you should consider them, or are they merely shallow attempts to get you to talk to one of their sales representatives? If your cell tower rent is undervalued, what's the fair market rental rate you should be getting, or should you wait until your lease is nearing expiration to renegotiate or extend the lease or speak with them about their purchase offer now? What about trying to hedge your bets against cell towers possibly becoming obsolete in the future, which is a typical scare tactic used by the cell site lease buyout companies? The pushy salesmen working for the major lease buyout companies peddle fear as part of their standard sales script posing questions that most landlords are not prepared to answer. How will things like IoT (internet of things), economic factors impacted by President Donald Trump like carrier mergers, or technological advances in wireless technology such as satellites, DAS (distributed antenna systems), 5G, WiFi, broadband, fiber-optics and Small Cells impact your lease? If there are no risks of the cell tower becoming obsolete, why am I getting so many offers to sell? What's in it for them? Or should you hold onto your telecommunications lease and reject their offers? It can be overwhelming and confusing trying to make heads or tails out of these offers. The truth is, that there are actually some legitimate risks that need to be factored into your decisions. One of the dirty little secrets of the telecom lease buyout industry, is that Wall Street Analysts advising the investment banking community prior to making significant investments in companies like SBA, American Tower, and Crown Castle, along with the CEO's of several of the better known cell tower lease financial companies have actually sought out OUR advice to analyze cell towers already in their portfolios and infrastructure assets they were thinking of purchasing, because they did not have the technical and telecommunications industry know-how to evaluate these towers. If the so-called "Lease Buyout Experts" from the major buyers of telecommunication infrastructure leasing cash flow firms and Wall Street advisors seek out our advice, we hope that you consider giving us a call to discuss your situation. CELL TOWER LEASE BUYOUT INDUSTRY. How do you know that your "Strategic Relocation" consultant, your cell tower lease buyout sales representative or "VP of Lease Acquisitions" consultant is lying to you? Well of course, because their mouth is moving! 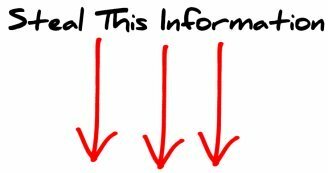 All humor aside, here are some of the biggest lies about the cell tower lease buyout industry that we will expose here for you to consider. LIE #1. This lie is told by the same companies offering a "Rent Guarantee" or a "Lease Optimization Program" that work as third party lap-dogs for the major carriers and cell tower management firms, and are also in the lease buyout business and will offer to purchase your lease. The #1 LIE that they tell cell tower landlords is, "If you don't give us a 25% rent reduction, the carrier will remove the tower." There is some truth to this lie, which makes it a good lie. The truth is, that about 1% of cell towers end up getting decommissioned or moved. There is a 99% chance that yours is not one of those towers. LIE #2. This is a lie told by the majority of the lease purchase companies that have telemarketers calling you, send you emails to solicit you to sell your lease to them, and also mail you all sorts of junk mail. "We will market your site and split the revenue with you on any new carrier tenants that we bring to your tower." Here is a summary of their marketing plan. The truth is, that the commissioned sales people trying to get you to sell your lease are reading a sales script. If you have a 100' x 100' fenced in lease Premises on your land with plenty of interior room available for additional equipment, why would a wireless carrier agree to lease space outside of the fence? LIE #3. This is a lie told by some of the well known Lease Buyout Firms you know by name, and many of the smaller buyout brokers. Sometimes it is hard to tell the difference between the two firms, but they often time have the same lie in common. "There are no hidden fees." The truth is that many of these firms have secret back-room deals with their end-users that pay them a few points in addition to any brokerage fees, or commissions that they charge you up front. Many but not all of these companies double-dip make a commission on the front and the back of the transaction. Sometimes the back end fee does not come out of your purchase price, and sometimes it does. The seller will probably never find out. There are many more items that we could list here, but we hope that you get the point. Honestly and integrity are in short supply, and this sub-industry is self-regulated. We are one of the good guys in the industry, and we would like to earn your business. Bring us your best offer. WARNING: Do Not Sell Your Cell Tower Lease Rental Stream Until You Talk To The Owners Of Tower Genius. We can't stress this enough. Over the years we have had several disturbing and shocking conversations with wireless landlords who have sold a cell tower lease or cell site revenue stream without the proper guidance. Many of the so-called wireless industry experts in our industry have questionable business ethics, or major conflicts of interest. This holds true especially for the some of the so-called "independent" cell tower consulting "lease experts". Tower Genius will evaluate and will make you a solid one-time offer to purchase your cell tower lease cash-flow or rooftop cell site lease rental stream if it meets our strict investment criteria. We are cell tower lease buyers, not lease buyout brokers., difference being that we buy ugly towers, well actually their leases to be exact, and don't act as the middle man in the deal. But even if we decide to pass on your lease if your cell site does not meet our criteria and we decide to pass on making you an offer, we can still recommend a buyer might be willing to purchase the lease or refer you to a reputable broker that would fight to get you their best pricing. And we will also help you to steer clear of the bottom feeders in our industry. Need Cash For Your Cell Tower Lease? As is the case in any business where there is a large amount of money to be made quickly, such as in the case of selling cellular leases, there are boiler-room sales organizations and there are honest firms and individual private investors offering cell tower buyouts. How can the average cell tower landlord separate the wheat from the chaff when comparing wireless lease buyout offers? Think of Tower Genius as your filter. Some of these firms WILL literally rake you over the coals without the proper guidance. Make sure you don't get taken advantage of. Talk to Tower Genius about your cell site lease buyouts and call us at 1-888-313-9750 from anywhere in the USA. 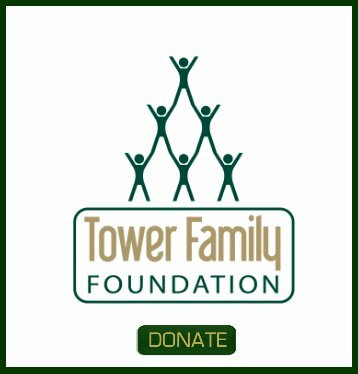 Tower Genius is an independent landlord advocacy and cell tower lease consulting firm founded by cellular leasing industry experts with nearly 50 years of combined cell tower site development and leasing experience. We talk to dozens of cell tower landlords every week, and regularly review tower buyout offers to help landlords understand these proposals and maximize their transactions if they have decided to sell. Our Partners have been quoted in the Wall Street Journal, Cranes, The New York Times and other major publications about cell towers and trends in wireless infrastructure. We can also help you with any technical or lease related questions you may have regarding your cell towers or cell sites. Don't Get Burned On A Cell Tower Lease Buyout. 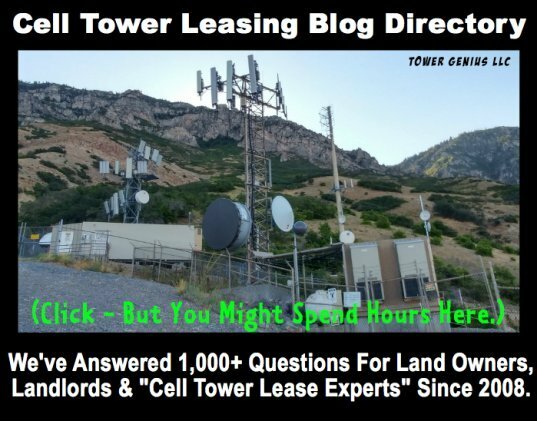 Are you a cell site landlord with a question or comment about selling or perhaps purchasing a cell tower lease? Have you been approached by a lease buyout company offering you a perpetual easement to purchase your cell site lease rental stream? This is not a blog for shameless self-promotion by industry sales reps. Although we appreciate your participation, if you work for a lease buyout company, this is not a place to toot your own horn or bash your competition. Please keep it informative and on topic. Thanks! Lets hear your question. Your blog question will appear on a Web page exactly the way you enter it here. Do you have some cell tower pictures to add? Great! Click the button and find the first one on your computer. Select it and click on the button to choose it. Can you call me about these offers on my site. I am in Western Australia. My site is located at Lot 1001 Guilderton Rd Gabbadah. Finance against income stream from mono cell tower? Buy out of cell tower lease. Will the value of a cell tower (cash buy out) continue to go up in value or because of low interest rates or have they peaked? I have been approached to purchase my cell tower lease. Selling your cell phone tower leases. Cash for my cell tower lease. I was offered a lease buyout. Everybody wants to purchase my cell tower lease. Low ball offer from a cell tower lease buyer. Which is generally smarter...monthly or lump sum?